The driver information system in the instrument cluster shows you the status of various on-board systems at a glance. The display for the driver information system is in the centre of the instrument cluster. The system runs a check on certain components and functions when the ignition is switched on and while the vehicle is moving. It gives an audible warning if a fault should occur or if servicing is required, and a red or yellow warning symbol (in some cases with a corresponding driver message) appears in the dashboard display. The system will also display information for the radio and CD player and (if fitted) the route guidance directions from the navigation system*. For further information on these systems, please refer to the sound system or MMI* Operating Manual. 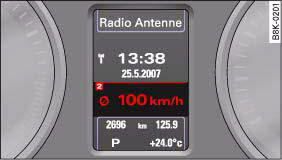 On some models the display of information shown in the instrument cluster differs from the illustrations used here. If a fault should occur, the display will show a red or yellow warning symbol. A red warning symbol indicates a serious malfunction. A yellow warning symbol indicates a less serious malfunction, or other item requiring attention ⇒ page 35. 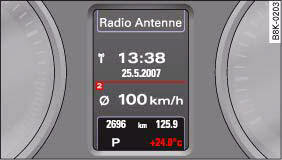 If no priority 1 or 2 faults have been detected by the auto-check control, the name or frequency of the current radio station and the selected waveband will appear the upper part of the display. When a CD is playing, the display will show the current title. If the vehicle is equipped with a CD changer* the display will also show the number of the CD being played (CD1 to CD6). The outside temperature is shown when the display is activated. At temperatures below +5°C a snowflake symbol appears next to the temperature display. This is to warn the driver to take extra care when there is a risk of ice on the road. When the vehicle is stationary or travelling at very low speeds, the temperature displayed may be slightly higher than the actual outside temperature as a result of the heat radiated from the engine. 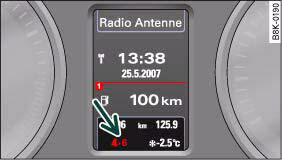 The temperature units can be set to °F or °C on the sound system or MMI* system. The outside temperature is automatically displayed in the units you have selected. Please refer to the sound system or MMI* Operating Manual for further details. Do not rely on the outside temperature display as an ice warning. Please bear in mind that there may be patches of ice on the roads even at outside temperatures around +5°C. This additional indicator function can help to save fuel. You can activate and deactivate the gear-change indicator on the sound system or MMI*. – Select: Function selector button CAR > Instrument cluster > Suggested gear ⇒ fig. 12. To familiarise yourself with the gear-change indicator, we recommend driving in the normal way to start with. A gear change will be recommended if the gear you are in is not the most economical choice. The gear you are currently in and the recommended gear will be displayed, fig. 11. • Shifting up a gear: The suggested gear appears to the right of the current gear when a higher gear is recommended. • Shifting down a gear: The suggested gear appears to the left of the current gear when a lower gear is recommended. Gears may ocassionally be skipped (3 > 5). If no gear-change is recommended, you are already in the most economical gear. • The gear-change indicator is intended to help save fuel. It is not intended to recommend the right gear for all driving situations. In certain situations, only the driver can choose the correct gear (for instance when overtaking, driving up a steep gradient or towing a trailer). 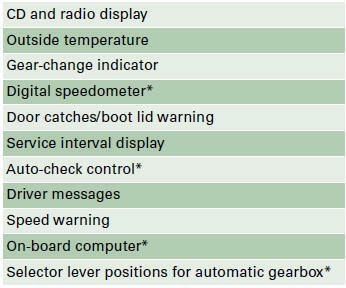 • The gear-change indicator in the instrument cluster, fig. 11 goes out when you press the clutch pedal. The display shows the current speed. 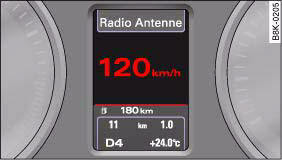 The speed is displayed in increments of 1 km/h. The pictogram shows whether the doors and the boot lid, etc. are properly closed when driving off. The door catches/boot lid warning symbol lights up if one or more of the doors, or the bonnet or boot lid are not properly closed when the ignition is on. The symbol also indicates which of these is not properly closed ⇒ fig. 14. The warning symbol disappears when all the doors, the bonnet and the boot lid are completely closed, and the driver information functions selected will then be displayed again. 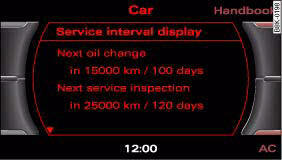 The service interval display detects when the next service is due for your vehicle. • Service reminder: When the next service date is approaching, Service in----- km--- days ⇒ fig. 15 will be shown in the instrument cluster display each time you switch on the ignition. The number of days and kilometres act independently of each other. Service due! will appear in the display when the number of days reaches zero, even if you have not yet driven the estimated number of kilometres remaining. Similarly, Service due! 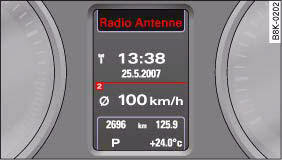 will appear in the display when the number of kilometres reaches zero, even if the estimated period has not yet expired. The remaining distance and time are updated and displayed briefly each time you switch on the ignition. • Service due: When a service is due, Service due! will appear in the display as soon as you switch on the ignition. The display reverts back to the standard display after a short time. In addition, a tone will sound. In the Car menu, you can look up the distance and time remaining until the next oil change and next service inspection. To do this, select function selector button CAR > Service interval display, fig. 16. 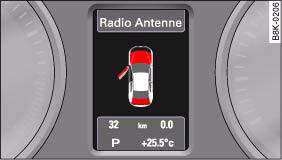 The display may not be complete on new vehicles within the first 500 km. Your Audi dealer resets the display after each service. You can only reset the oil change display yourself. To do this, select function selector button > Service interval display > Reset oil change interval. The next oil change will be indicated as being due 15,000 km or one year (fixed service interval) after the oil change interval is reset. 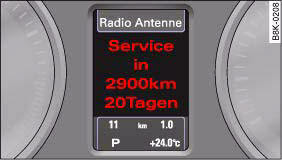 The system cannot calculate the figures for the service indicator if the battery is disconnected from the vehicle, so no service reminder can be displayed during this time. Please remember that keeping to the correct service intervals is most important for the service life and residual value of the vehicle (and especially for the life of the engine). The period between two services must never be longer than the time specified in the Service Schedule, even if you only cover a low mileage during this time. • Do not reset the display between oil changes - otherwise the display will be incorrect. • The information in the service interval display remains intact if the battery is disconnected. • The distance to the next service cannot be called up if the system has detected a Priority 1 fault (red symbol). • If the service was not performed by a qualified workshop, the oil change interval display can only be set to “fixed service intervals” of 15,000 km. If you wish to continue with the “LongLife” service, you will need to have the oil change interval display reset by a qualified workshop.